This is a re-post of a 2010 article I wrote for the Rawstudio blog, which at the time of writing is off-line. L1 cache sizes have not changed at all in 5 years. SSE 4.1 is more commonplace for flooring, but SSE2 is still needed for fallback. Intel has gather/scatter instructions on their newest CPUs, which helps lookups. It is no longer faster to transfer XMM->reg through memory. So overall, only a few things have changed in five years. Something that you are very likely to encounter, when writing SSE2 assembler is the issue of using tables for looking up data. While this is a very simple operation in C, it presents a challenge with a lot of pitfalls, when using SSE2. When to use lookup tables? This is quite tempting in C – especially if you can do some transformations on the value, by modifying the lookup table, if you need something expensive like the square root, use the inverted value. But lets look at the drawbacks. The table is 256KB, so you will run out of level 1 cache on most CPUs. In C the penalty for a value in L1 cache this is usually a couple of cycles per value, but if it has to be fetched from L2, we are talking about 15 cycles or more on most platforms. But if it saves you a division and a square root or something similar the trade-off may be ok for you. In SSE2, the trade-off picture is changed. Here the penalty per pixel for doing the lookup remains the same (or even rises), while calculating the value is usually only about 25% of cost of what the C-code. So you can see – we can do a lot more calculations in SSE2 before using a table should even be considered. What if I have to use lookup tables? There might be cases, where using tables are the only way, because calculating the values simply aren’t practically possible in SSE2. 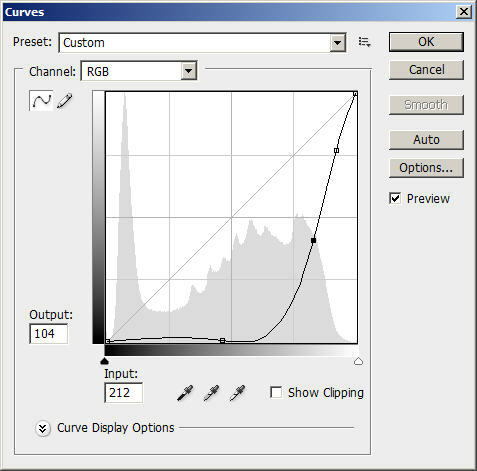 A practical example of this from Rawstudio is the curve correction, that involves mapping input values to output values based on an n-point 2D curve. Curve Correction: Nearly impossible without using lookup tables. In the “old days”, we used a table with 65535 16 bit entries, that simply gave the output value, much as the example above. The table was 128KB, so again, we had a lot of L1 cache misses. When we re-wrote colour correction, everything internally was converted to float, which made the table 256KB, and even slower. Furthermore it also made sure that we lost a lot of the float precision, by having to fit the float values into 65535 slots. Since most of these lookups are fairly linear, without too sudden peaks, usually we are fairly in the clear if we reduce the precision of the table, and do linear interpolation between them instead. This avoids posterizing the image data, because all float values will have a unique output. Here is an example, where we use a curve correction with only 256 input/output values, and interpolate them instead. // "if (lookup > 255)" later. So now the table is only 1KB in size and fits very nicely within the Level 1 cache. This approach solves both our problems, but at the expense of some calculations. Whether 256 entries are enough is up for you to decide, but the principle applies for all sizes. The “floor” function can be quite slow on some compilers/CPUs, but it is here to demonstrate the algorithm. We will touch this later. So now we are ready for putting a version together in SSE2. I mentioned that we would look separately at the “floor” function, so lets start by looking at that. In SSE2 there isn’t any instruction that can do float rounding. It has been added in SSE 4.1, but that is only available on a minority of computers. The most obvious way is to do a float -> int -> float conversion. Unfortunately, if you look at the instruction timing of the “cvtps2dq” and “cvtdq2ps” it has a latency of up to 50 cycles on Pentium Netburst (P4) and AMD K8. That means you risk having to wait 100 cycles before the result is available. Intel Core 1 and newer have much better timing for these instructions, so in most cases it is not a huge problem. But digging around on the internet, I found this rather nice trick, that uses the float point point trick, that will overflow 32 bit float to the point where all information below the single digits is rounded off. On Core 2, it has the same timing as a conversion, but it is considerably faster on older systems, assuming you can hide the cost of the load in other code. Do note, you can NOT use this trick in C, since x87 float float operation have greater internal precision. I have only tested this with positive numbers, I think it will have to be modified to work with negative ones too (masking out the sign and re-applying it). Here is the algorithm. Input and output is “__m128 v”, which contains 4 values to look up and are values between 0 and 1. For 4 pixels we have 4 lookups into the curve table, because we load the two adjacent values with a single 64 bit load. All the math in the “Calculate fractions” is independent from much of the code above and below, so the cost of this calculation is basically hidden by the memory lookups on superscalar CPUs. “shuffle_ps” (shufps) isn’t the fastest operation in the world, but I haven’t found any good alternatives in SSE2. But there are still a few questions that remain unanswered. Why are you transferring lookup values through memory? This might seem a bit strange, but unfortunately the alternatives are quite slow. The most obvious alternative is “pextrw”. This instruction have a latency of 2.5 cycles on new platforms and considerably more on Netburst/AMD K8. All modern CPUs have a feature called “store forwardning”. There are a lot of restrictions on this, but what it basically means is that if you store an aligned value, and read aligned values, the CPU will bypass the cache and forward the value directly. So again, this method is considerably faster on older systems, but if you do a separate SSE 4.1 version you might want to use pextrw instead. Aren’t unaligned loads of 64 bit value slow? The first issue is not optimal, but the second issue is pretty bad – the penalty is more than 20 cycles on Intel CPUs. But luckily we can fix the issue by re-ordering our data. This solves both our problems, since all our loads are aligned and we don’t read across cache line boundaries. A final issue when dealing with lookup tables is to preheat – or pre-load the values before you start using them. If the table values are not in cache, you will get a massive penalty when you hit a value that hasn’t been used before. Be sure your compiler doesn’t optimize out your load, because it thinks you wont be using the value. The cache line size is 64 bytes on most modern machines, and as far as I recall no SSE2 machines have a cacheline size less than 64 bytes. This optimization is also one that can be used in your C-code, but you might want to use a cacheline size of 32 bytes to accommodate older machines like Pentium 3 and AMD K7. Intel® 64 and IA-32 Architectures Optimization Reference Manual – the ultimate guide for optimizing. Years of learning here. Software Optimization Guide for AMD AMD edition of the document above. These two mainly contain the same information. Diary Of An x264 Developer – has some very good optimization stories. Edit: Original site is down, so archive link used. Avery Lee’s blog on Virtualdub – also some very good performance tips and stories.